Your article heading as "Let us be True to one another" published in the A.B. Patrika (Allahabad Edition) D/30.12.51 attracted my attention and I read it over and over again. This article contains the nucleus of future activities of the human society in the spiritual realm and I have read in your statement about your deep thought on the onward march of human civilization. You have rightly said the following words in this connection viz. "So we search for new ways, new aspects of the truth more in harmony with our environment. And we question each other and debate and quarrel and evolve any number of 'isms' and philosophies. As in the days of Socrates, we live in an age of questioning, but the questioning is not confined to a city like Athens: it is world wide." There are two ways of answering such questions, I mean the deductive way and inductive way. Mortality of man is established by either of the above ways. In deductive way we take it for granted from reliable source, 'Man is Mortal.' But in the inductive way we approach the same truth by our poor reasoning of observation and experiment.' By observation we can see that Gandhi dies, Fotilal dies, C.R. Das dies, Patel dies and therefore we conclude that man dies or "Man is Mortal." Then again in the same deductive way when we reason that man is mortal, and find that Jawaharlal is a man and thus conclude that Jawaharlal is mortal. Truth means Absolute Truth. Relative truth is conditional and when the conditions fail, the relative truth disappears. But Absolute Truth does not exist on conditions, it is above all conditions. So when we speak of truth, we may take it for the Absolute Truth. And when we speak of approaching the Truth by new ways, we may take it for granted that we want to approach the Truth by the inductive way. Satyam Param Dihmahee -- the summum bonum. And from this Absolute Truth everything emanates. 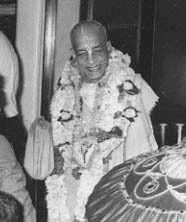 "Janma-dyasya Jataha." This Absolute Truth is described in the Vedic literatures as Sanatana or Eternal. And the philosophy or science which deals in such eternal subjects is described as Sanatana Dharma. Therefore, we have first to find out the Eternal Absolute Truth by some new ways(?) and then we have to find out the new aspects of Absolute Truth in harmony with our present environment. 1. People in the present age are generally short living. The average duration of life being 30 years or so. 2. They are generally not very simple. Almost everyman is designing and crooked. 3. They have no scope for high thinking because they are perplexed with different relative truths. 4. Unfortunate as they are in this age their problems remain unsolved for the whole life even though they are tackled by their leaders. They make the best effort to solve a problem but unfortunately the same becomes more acute and stringent. 5. And above all, people in this age are always distressed by famine, scarcity, grieves and diseases in an increasing ratio. In the old days life was not so much conditional and encumbered. The simple problems were then the problems of bread, clothing and shelter which were solved by the simplest process. By agriculture they used to solve the bread, clothing and shelter problems and industrialisation was unknown to them. Thus they had no idea of living in big palatial buildings at the cost of sacrificing the boon of humanity. They were satisfied to live in cottages and yet they were perfectly intelligent. Even the famous Chanakya Pandit who was the Prime Minister of India during the reign of Chandragupta, used to live in a cottage and draw no salary from the State. Such simple habits did not deteriorate his high intelligence and dignity and as such he had compiled many useful literatures which are still read by millions for social and political guidance. Thus the simplicity of Brahminical culture was an ideal to the subordinate others of the society and in the Deductive way the subordinate orders, namely the Ksatriyas, the Vaishyas and the Sudras would follow the instruction of the cultured Brahmin. Such ways of approaching the Truth is always simple, plain and perhaps the most perfect. The cultured Brahmin-order of the society would declare that there is God or Brahman and the Kshatriyas, Vaishyas and the Sudras who were less cultured than the Brahmins -- would follow the latter faithfully call it blindly or otherwise. By such faithfully following the subordinate classes would be able to save much time in the matter of arguing and reasoning for the existence of God at all, and still they would not be called faithless. A really cultured learned fellow is far above a politician. Because a politician is honoured by votes of his countrymen while a cultured and learned fellow is honoured everywhere all over the world. So we say that Rabindra Nath and Gandhi were never dependent for the votes of their countrymen but they were honoured all over the world for their cultural contribution. The same Chanakya Pandit defined the standard of learning. The standard of learning had to be testified by its result and not by the manner of University degrees. He said that one who looks upon all women except one's married wife as mothers -- all other's wealth as the pebbles on the street and all living being as one's own self -- is really a learned fellow. He never stressed on the the point of standard of how many grammars, rhetorics or other books of knowledge one might have gone through, or how many Doctorates of different Universities one might have been decorated with. At the present moment we know very well that few men look upon other women besides one's married wife as mothers; very few men will look upon other's wealth as pebbles on the street and very few men will try to behave with other living beings as one wants to be treated oneself. The sages of old age discovered it by spiritual culture that man's energy should be utilised only for spiritual realisation. Not to speak of Lord Shree Krishna who spoke the philosophy of Bhagwat Geeta near about 5000 years ago, we know that within 2000 years of human history no sages including Jesus Christ, Prophet Mohammed, Lord Buddha, Acharya Shankara, Madhya, Ramanuja or even Lord Chaitanya gave any importance to materialistic way of living. Material necessities were always subordinate to the spiritual realisation. They saw it that the bread problem, clothing problem and shelter problem are never solved by material activities because in the law of nature the elephant is given the whole jungle to eat and the little ant is given a grain of sugar to solve their respective bread problems and yet the animals remain hungry. It is not the question of a jungle or a grain of sugar that can solve our bread problem but it is the question of real food that can quench the hunger of human being and revitalise him to proper life. Human being therefore should not be encouraged to satisfy his unsatiated hunger like the giant elephant or the little ant but he should be trained up otherwise which shall provide for his real food. The wonderful temples, the mosques and the cathedrals of past centuries were built up to give them the real food and were not built up by the blind or unquestioning faith. They were built up on full faith and reasoning which were based on the deductive process. The Vedas, the Bible or the Koran would ask the human being to make proper use of his conserved energy in the transcendental service of God and unsophisticated men in the old days would follow such instruction unhesitatingly for realising the Absolute Truth. Such temples, mosques were therefore centers of high culture to provide real food to human consciousness. But in the present age in the absence of such high culture there is hardly any difference between the temples, mosques and cathedrals and the high commercial buildings in a busy city. If the culture is to be revived it is quite possible to do it even in your parliamentary buildings in New Delhi or in the commercial buildings of New York. As the Socratesian ways of reasoning is not bound up within the walls of Athens so also the Brahminical culture is not bound up within the walls of India. You can find out the nine prescribed qualifications of a Brahmin, the seven qualifications of Kshatriyas, the three qualifications Vaishya and the one qualification of of a Sudra, world wide. You can therefore pick up Brahmins and other orders of society all the world over. Gandhiji although born in a Vaishya family, possessed almost all the nine qualifications of a Brahmin and if possible we can find out such Brahmin in other parts of the world. One Brahmin-Gandhi Congressman is quite competent to guide its principle whereas thousands other sudra congressmen can only help to break it up into pieces. Thus if we want to approach the Absolute Truth in new ways in harmony with present environment we should try to be true to one another in the qualified way of Brahminical culture. Only a dozen of real qualified Brahmins from all parts of the world should combine to guide the principles of the Kshatriyas, the Vaishyas and the Sudras all over the world. The Socratesian way of reasoning should be fully utilised because that makes the only difference between a human being and a beast. There is ample scope for this new way of approaching the Absolute Truth and that will only solve the acute distressing world problem. If there is scarcity of such qualified Brahmins which I honestly think there is, we should combine to evolve such Brahminical culture not by blind faith but by sound reasoning and questioning. But all the same we must be sincere and thorough in our attempt. As an humble disciple of Om Vishnu Pad Sree Sreemad Bhakti Siddhanta Saraswati Goswamin, I wish to remain always true to you and everyone. And if you sincerely be true to your forefather, I mean the Brahminical culture, you have the strength and capacity to save the world by presenting the Brahminical culture once again for consummation of the distressed world. In such acts of your broadness of mind, I am always at your service.